For the dirty rice arancini: Place the chicken stock in a small pot with a fat pinch of saffron and bring to a simmer. Let simmer for a few minutes to infuse. Keep warm over low heat. Melt 1 tablespoon of the butter with 1 tablespoon of the olive oil in a medium saucepan. Add the chicken livers and hearts and saute until cooked through. Deglaze the pan with the sweet vermouth and let evaporate. Remove the hearts and livers from the pan and set aside. To the same pot, add the remaining tablespoon olive oil. Add the pancetta and cook until browned and crisp. Add the onions and garlic; cook for a few minutes. Add the rice and toast for another 3 to 4 minutes. Deglaze the pan with the white wine and let evaporate. Begin adding the warm stock a ladleful at a time. Cook, stirring constantly, until the rice has absorbed all of the stock before adding the next ladleful. Do this for 17 minutes. When finished, remove the risotto from the heat and stir in the chicken hearts and livers, the remaining 2 tablespoons butter and the Parmesan. Add salt and pepper to taste. 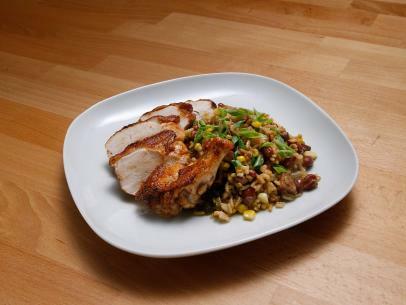 Pour the risotto onto a parchment-lined baking sheet and place in the refrigerator to cool. Heat the oil in a deep fryer to 350 degrees F..
Set up a breading station: In the first shallow dish, place the flour and season with salt and pepper. In the next dish, add the beaten eggs and a touch of water; season with salt and pepper. In the last dish, mix together the breadcrumbs, cornmeal, pecorino, parsley, fennel pollen, red pepper flakes, orange zest and lemon zest. Take the cooled risotto out of the fridge, form into Ping-Pong-ball-size balls and roll tightly. Dredge the rice balls in the flour, then the egg wash and then in the breadcrumb mixture. Fry in batches until golden brown, about 3 minutes. Remove to a paper-towel-lined plate and season with salt. For the saffron aioli: Place a small skillet over medium-low heat. Add the olive oil, followed by the garlic, lemon zest, orange zest and saffron. Cook for 1 minute. Set aside to cool. In a small mixing bowl, whisk together the egg yolk and mustard. Whisking constantly, slowly stream in the grapeseed oil to emulsify. When all of the oil has been added, season with salt and lemon juice. Stir in the cooled saffron mixture to combine. 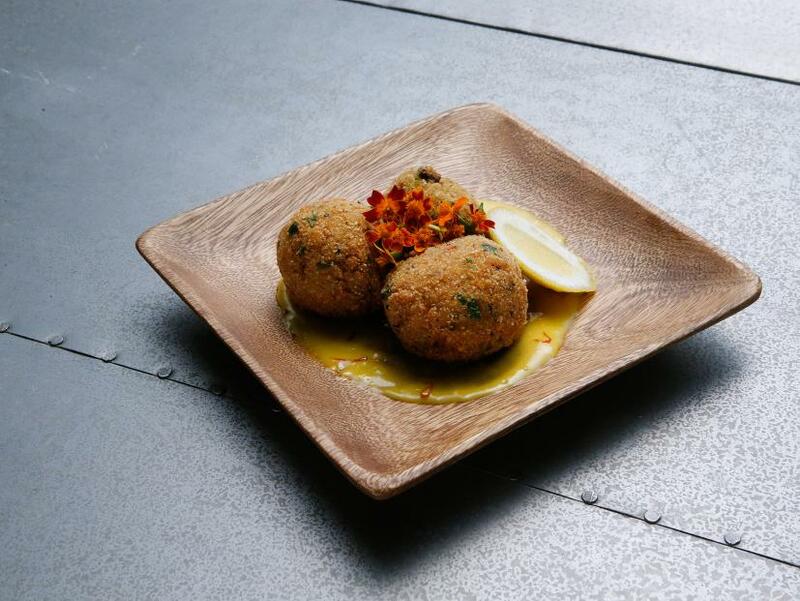 Serve the arancini on a plate with saffron aioli and lemon wedges.